NEW YORK-DECEMBER 1: The New York Women's Foundation STEPPING OUT & STEPPING UP Gala honoring Agnes Gund and Grace Hightower De Niro & Robert De Niro on Wednesday, December 1, 2010 at Gotham Hall, 1356 Broadway, New York, NY 10018 (212) 244-4300. The New York Women’s Foundation®’s (NYWF) hosted it 23rd Annual Stepping Out and Stepping Up honored Agnes Gund as well as Grace Hightower De Niro and Robert De Niro at New York City’s Gotham Hall. Good Morning America’s Juju Chang hosted the special evening, which began with an address by Mayor Michael R. Bloomberg to the nearly 300 guests in attendance, which included filmmaker Jane Rosenthal, Muffie Potter Aston, philanthropist Anne Bass, Mexico’s Deputy Consul General in New York Ismael Naveja Macias, as well as Gala Vice Chairs Jean Shafiroff, Susan R. Cullman, Carolyn Buck Luce and Gala Co-Chairs Hyatt Bass and Somers Farkas with husband Jonathan Farkas. 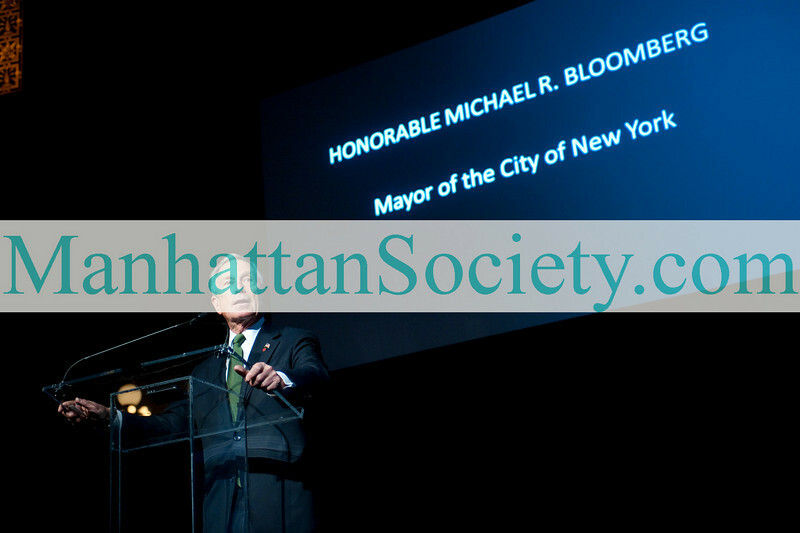 Mayor Bloomberg praised Agnes Gund as having “singlehandedly changed our city’s cultural landscape,” and the De Niros, saying “these two New Yorkers really couldn’t be more deserving…they care deeply about this city” while commending DeNiro for his vision and commitment to New York City in launching the Tribeca Film Festival in Lower Manhattan after the attacks of September 11th. The Stepping Up Award is presented to recognize New Yorkers who serve as role models and demonstrate courageous leadership, vision and commitment to women and girls as individuals and as partners. City Commissioner of the Department of Cultural Affairs, Kate Levin presented TheStepping Up Award to Agnes Gund. Accepting her award, Agnes Gund expressed her gratitude and emphasized her belief that “funding the arts is funding the well-being of children…to clarify who they are…to communicate who they are,” praising the hard work of her organization, Studio in a School. Before the presentation of their award, iconic film director Martin Scorsese wished to say a few word about the De Niros but was unable to attend, as he was filming in Italy; a special pre-recorded video message from him played for guests, in which Martin congratulated the couple of their honor, saying “Grace, I applaud the exceptional work you’ve done…Bob, I’ve seen you give so much to the city.” Following the video, Gala Vice Chair & NYWF Board Chair Diana L. Taylor presented the award to Grace Hightower De Niro and Robert De Niro. Accepting the award, Robert remarked “I have the feeling I’m receiving this honor not for anything I’ve done, but for what Grace has contributed.” Following Robert, Grace encouraged guests, saying “let us give praise to those women…in sink or swim situations everyday…who choose to better their lives.” As NYWF President & CEO Ana L. Oliveira explained, the Foundation is “not a traditional foundation…it is a public foundation [producing] community-based authored solutions;” Ana also reinforced the message that “when we invest in mothers, we invest in children…when we invest in children, we invest in our future.” About: The New York Women’s Foundation® is a cross-cultural alliance of women, serving as a force for change for women. From the outset, the Foundation’s founders strove to identify innovative organizations that were affecting change in the communities they served for women. NYWF strategically funds organizations and programs that move women, girls and families towards long-term economic security through individual transformation and systematic change, mobilizing leaders and community partners as philanthropists and change agents. NYWF funds programs in that promote economic security and justice, health and sexual rights, positive development of girls and young women, and safety. MEDIA CONTACT: Lawlor Media Group | 443 Park Avenue South, Suite #1008, | New York, NY 10016 | Tel: 212-967-6900 | Fax : 212-967-9123 | e-mail: RSVP@lawlormediagroup.com | Event Production by Inez Weinstein Special Events, Inc. PHOTO CREDIT:Copyright ©Manhattan Society.com 2010 by Christopher D.M. London | tel: Private | e-mail: ChrisLondon@manhattansociety.com********PLEASE NOTE: More photos to come later this evening.